There are a lot of visual schedule apps on iTunes, but what about video schedule apps? Sometimes it is easier to show somebody how to complete a task with a video than breaking down each step. The Video Scheduler application is an affordable way to create both visual and video schedules! 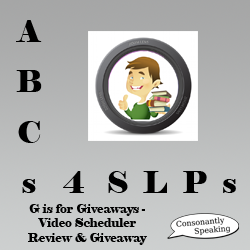 Continue reading for my review of the Video Scheduler application and a giveaway! The Main Page of the application has four large buttons and one small button on it - View Schedule, Edit Schedule, Create Schedule, Add Shared Schedule, and Help. Pressing the "Help" button at the bottom of the screen will discuss how to use the application, show where to view video tutorials and sample schedules, how to adjust settings on your device, how to set a passcode, how to share a schedule/download a shared schedule, the developer's website, and an e-mail to contact the developer. Pressing the "View Schedule" button will bring you to the "Users" page. Choose a user from the list to view the schedules created for that user. Then, choose a schedule from the list to view. Each step/task will appear in sequence on a list for the particular activity. Press the step/task to be focused on from the list. There will be text and/or an image for each task. Once pressed, the image/text/video will appear full-screen. If the task has been completed, press on the image/video and then press "Done". Otherwise, press "Repeat" to show the image/video again. A checkmark will appear next to the step/task on the list and one can continue by repeating the above steps. To edit a schedule you have created, press the "Edit Schedule" button. Then, choose the user in which the schedule you wish to edit is associated with or press the "Edit" button at the top to edit a user's name/delete the user. If you wish to edit the title of a schedule, move a schedule in the list, or delete a schedule, press the "Edit" button in the top, right hand corner of the page. Otherwise, choose the schedule you wish to edit. If you would like to edit a task, the order the tasks appear in, add/delete a task/step, or reset the checkmarks, press the "Edit" button in the top, right hand corner of the page. To edit a task/schedule after you have pressed the "Edit" button, press on the task/schedule you wish to edit. Then, you can press the "Edit" button to re-write a name or choose another image/video associated with the schedule/task. Press "Done" when you are done editing. If you would like to change the order of schedules/tasks, press the "Edit" button, then press and drag the schedule/task to where you would like it to appear on the list. If you would like to add a new task, press the green "+" button. To delete a schedule/task, press the red "-" button next to the schedule/task you wish to delete. To create a new schedule, press the "Create Schedule" button. Then, choose a user to associate the schedule with or add a new user. To add a new user, press the "Add User" button, then enter user details including name and a profile picture (optional). You can choose different settings for a users' schedules via on/off switches including screen loc, following schedules sequentially, and requiring a password. Press "Save" and the user will appear on the Users list. Once you choose a user by pressing on his or her name, you can add a schedule. Press the "Add Schedule" button. Next, add a title and associated image. You can also decide to turn on or off video modeling mode. If on, it only models the tasks but doesn't use them to check off a list. Press "Save" in the top, rght hand corner of the page. After that, press "Add Task" to create the first task for the schedule. 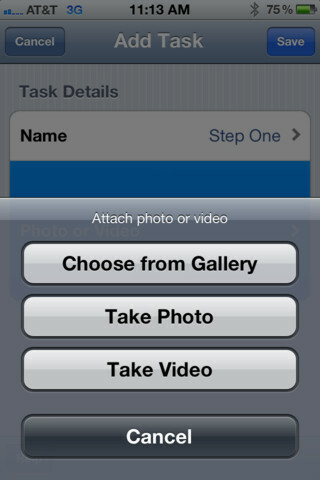 Write a name and choose a photo or video to associate with the task. Then, press "Save". You can then add as many tasks as needed. It is amazing that one can use photos or videos for a schedule/task. The ability to check of tasks when they are completed is helpful for students who need to see what tasks have been completed and which are remaining. 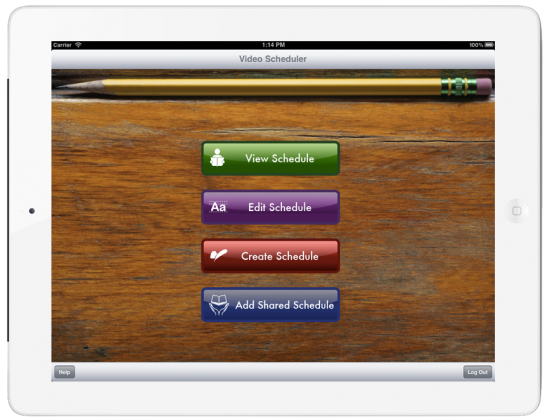 Sharing schedules is perfect for children who needs to share files between iPads such as between school and home, therapy and home, therapy and school, and therapists who have great ideas for schedules. Having multiple user profiles is great for those who have more than one child with special needs or who work in a classroom with multiple children with special needs. It is always helpful to have pre-installed images to use in case it is difficult to take a picture of or search for what you need online. I understand that having pre-installed images could drive up the price a bit due to the price of purchasing images to install on an app. Visual Schedule - Visual schedules are great for reducing anxiety and transitions. Use visual schedules with children who need them to stay on task, transition without anxiety, need to know what is coming up next, etc. Sequencing - Use the visual schedule to help children learn how to sequence events, sequence tasks, or put items in order. In addition, one can discuss the events that are going to happen throughout the day with the child ahead of time. 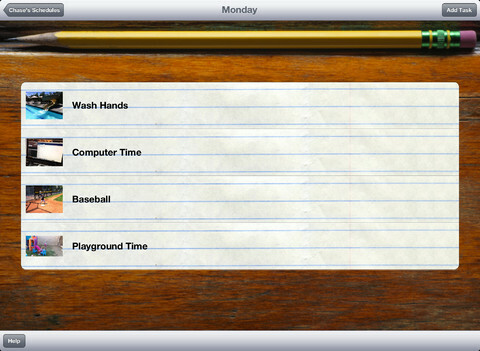 Video Scheduler is available for $12.99 for both the iPhone, iPod Touch, and iPad. You can vote for this application on Yapp Guru's website!